Vintage - Elizabethan Fine Bone China in the "Clifton" Pattern - Made in the 1950's - Total of (9) Pieces. This beautiful Set having the "Clifton" Pattern by Elizabethan, consists of (9) Pieces including 4-Cups, 4-Saucers and 1-Sugar Bowl. 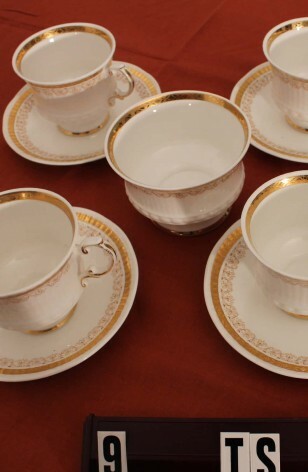 A truly Bright White Background, with a wide 22kt Gold Band at the Rim of Cups, Saucers, and Sugar Bowl. Cups also have 22kt Gold on the Handle and Foot. All Pieces also have a 22kt Gold Filigree Band under the 22kt Gold Rims. Very sophisticated look with lots of 22kt Gold for emphasis.